Maritime limits and boundaries for the United States are measured from the official U.S. baseline, recognized as the low-water line along the coast as marked on the NOAA nautical charts in accordance with the articles of the Law of the Sea. The Office of Coast Survey depicts on its nautical charts the territorial sea (12 nautical miles), contiguous zone (24nm), and exclusive economic zone (200nm, plus maritime boundaries with adjacent/opposite countries). Click on limit or boundary for specific information. Data shown is available for download. To view ESRI shapefile, you might need ArcGIS Explorer. To view KML, you might need Google Earth. Dynamic map services are updated whenever we make updates to our data. If you are using maritime boundaries in a web map or as a background for other data, we recommend using our dynamic services, as they will seamlessly update in your application. For information about using dynamic map services, please see the frequently asked questions page (FAQ). NOAA is responsible for depicting on its nautical charts the limits of the 12 nautical mile territorial sea, 24 nautical mile contiguous zone, and 200 nautical mile Exclusive Economic Zone (EEZ). These zones are highlighted in orange. The territorial sea is a maritime zone over which the United States exercises sovereignty. Sovereignty extends to the airspace above and to the seabed below the territorial sea. The U.S. territorial sea extends 12 nautical miles from the baseline. The contiguous zone of the United States is a zone contiguous to the territorial sea. In this zone, the U.S. may exercise the control necessary to prevent and punish infringement of its customs, fiscal, immigration, cultural heritage, or sanitary laws and regulations within its territory or territorial sea. The U.S. contiguous zone is measured 24 nautical miles from the baseline. 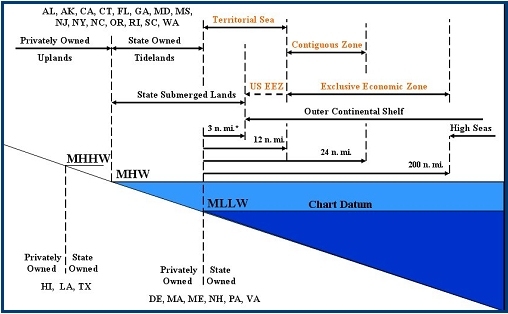 Certain U.S. fisheries laws use the term “exclusive economic zone” (“EEZ”). While its outer limit is the same as the EEZ on NOAA charts, the inner limit generally extends landward to the seaward boundary of the coastal states of the U.S. For the seaward limit of the states jurisdiction under the Submerged Lands Act, please see GIS Data / Shapefiles. Maritime boundaries with adjacent and opposite countries are established through agreement and treaties with these neighboring nations. For more information about these treaties, visit the Department of State information page on maritime boundaries. In 2011, the Office of Coast Survey completed a multi-year project to merge all of the regional maritime limits into a single seamless digital dataset. Because U.S. maritime limits change, based on accretion or erosion of the charted shoreline, Coast Survey, in conjunction with the U.S. Baseline Committee, continually maintains the dataset. When NOAA releases a new nautical chart the maritime limits and boundaries are updated as needed. This page highlights regional or local updates to the dataset. Where can I find electronic data of state territorial waters at 3 nautical miles (or 9 nautical miles off of Texas, Puerto Rico, and the west coast of Florida)? The Bureau of Ocean Energy Management (BOEM) manages and disseminates the Submerged Lands Act federal/state boundaries. Electronic data is here. Go to the links under “GIS Data / Shapefiles” to download data for a specific region. Note: the Gulf of Mexico dataset is in the sub-link, "Gulf of Mexico Geographic Mapping Data." How are the U.S. maritime limits drawn? The U.S. maritime limits are projected from a "normal baseline" derived from NOAA nautical charts. A "normal baseline" (as defined in the 1958 Geneva Convention on the Territorial Sea and the Contiguous Zone and Article 5 of the United Nations Convention of the Law of the Sea) is the low-water line along the coast as marked on offical, large-scale charts. Since "low-water line" does not reference a specific tidal datum, the U.S. applies the term to reference the lowest charted datum, which is mean lower low water (MLLW). The maritime limits are created using “envelope of arcs,” a method by which one rolls a virtual circle along the charted low water line and selects salient points. These salient points are called "contributing baseline points." Arcs generated from these baseline points are blended together to form a continuous limit line or envelope of arcs. The U.S. Baseline Committee reviews and approves the limits of all maritime zones on NOAA charts. It gains interagency consensus on the proper location of the baseline, using the provisions of the 1958 Convention on the Territorial Sea and the Contiguous Zone, to ensure that the seaward extents of U.S. maritime zones do not exceed the breadth permitted by international law. Current members of the Committee include the Departments of State (Chair), Commerce (NOAA), Justice, Interior (BOEM), and Homeland Security (Coast Guard), among others. What initiates updates to the digital U.S. maritime limits and boundaries? The primary triggers for updates include accretion or erosion of the charted low water line by approximately 500 meters or more, or changes to low tide elevations (i.e., rocks awash) as a result of new hydrographic survey information. The Office of Coast Survey and the Baseline Committee will investigate these changes for new edition chart. There are approximately 12 new editions issued each month, and a small number of these charts depict features that impact the U.S. baseline or maritime limits. The Baseline Committee, which meets four to six times per year, reviews and approved all proposed revisions. Another trigger for change may be the U.S. ratification of a new treaty with a neighboring coastal State. Some areas for future change include the U.S. waters adjacent to Canada, the Bahamas, Kiribati, Tonga, and the Federated States of Micronesia, to name a few. How often are digital U.S. Maritime Limits and Boundaries updated? Depending on the level of change as well as the chart production schedule (see Standing Over Notice ), the Office of Coast survey may update the digital U.S. maritime limits and boundaries as often as every few months in certain localized areas. Though we provide both dyanmic and static datasets, we recommend using our dynamic data services to ensure the most up-to-date version of the U.S. maritime limits and boundaries. We provide an archive of past updates to explain what has changed in each release of the data. How do I use dynamic web mapping services? We offer dynamic data is two formats: OpenGIS ® Web Map Service (WMS) and proprietary ESRI REST service. The WMS can be used in various desktop GIS software as well as web mapping applications. The WMS link leads to the GetCapabilities page, which provides easy-to-read, detailed information about the data as well as the necessary link to load the data into a GIS or web mapping application. Open Geospatial Consortium (OGC) provides more information about web mapping services. For users who prefer to work within the ESRI software environment, we provide an ESRI REST (Representational State Transfer) service. This service can be used in ESRI’s ArcGIS Desktop software or in ESRI’s free ArcGIS Explorer Desktop. It can also be added as a layer in web mapping services, such as ArcGIS Online. What information is provided with the dataset? 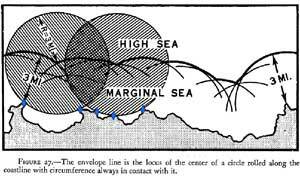 Type of Feature: features can either be a land boundary (between the U.S. and Canada), a maritime limit, or a maritime boundary between the U.S. and an adjacent or opposite country. Legal Authority: treaty, agreement, or proclamation granting the government authority to establish the limit or boundary. Supplemental Information Document: ink to metadata about the specific boundary segment. The document supplements the parent metadata record. Unilateral Claim: some maritime boundary claims have not been agreed upon by all parties. These boundaries are designated as unilateral claims. Description: specific category of maritime limit/boundary. Why is the digital product different from the product printed on the chart? Because of a difference in the chart printing schedule and the digital data update schedule, the digital data and the paper charts might not always be identical. In the event that the digital product and the paper charts differ, the maritime limits and boundaries on the paper charts take precedence. How can I access the three nautical mile line that is printed on NOAA nautical charts? We find that most people who seek this line are actually looking for the Submerged Lands Act federal/state boundary provided by BOEM (see FAQ #1). For those seeking the ambulatory three nautical mile territorial sea limit, we recommend that you use the seamless raster nautical chart service provided by the Office of Coast Survey. For hundreds of years, the marine environment was free from regulation of fishing, shipping, and resource exploitation. Over time, coastal States (countries) had an increased interest in national security and the enforcement of laws to protect its commerce and marine resources. As a result, a balance was needed to maintain the freedom of navigation that many foreign maritime interests had relied upon. This need for balance is captured in the history of the law of the sea. The birth of a nation’s authority to control its coastal waters has been traced back to the sixteenth century. In the seventeenth century, the father of international law and doctrine on the freedom of the seas, Grotius, recognized the existence of a nation’s jurisdiction over the coastal waters that could be effectively controlled from the land. The extent to which a nation could control its coastal waters was largely based on the reach of its cannons on the shore. Thus, the 3 nautical mile (nm) limit of the territorial sea resulted from what is often referred to as the “cannon shot” rule. In the U.S., the creation of a territorial sea and contiguous zone date back to as early as the late 1700s in response to issues of national security and law enforcement at coastal areas, including a 1793 diplomatic note sent from Thomas Jefferson and legislation passed by Congress in 1799 to allow the boarding of foreign flag vessels within 12 nm from the coast. This zone was known as “customs waters” and was later called the “Contiguous Zone.” By 1930 the proprietary rights of the coastal state over the resources of the territorial sea was well established, provided it did not interfere with a vessel’s right of innocent passage. In 1945, President Truman issued a proclamation asserting rights to explore and exploit the oil and gas resources of the continental shelf outside of the 3 nm territorial sea. In 1953, the U.S. Congress enacted legislation over the federal and state control of the continental shelf. In 1958, international conventions were concluded in Geneva on the territorial sea, contiguous zone and continental shelf. The concept of a fishery conservation zone was born in another Truman Proclamation but Congress did not enact laws regarding a 200 nm fishery conservation zone until 1976. This evolved into a zone whereby a coastal nation had exclusive control over all economic exploration and exploitation of the natural resources off its coast. By 1982, the custom of asserting a 12 nm territorial sea, 24 nm contiguous zone, and 200 nm EEZ was codified in the United Nations Convention on the Law of the Sea (UNCLOS). The U.S. proclaimed a 12 nm territorial sea in 1988, a 24 nm contiguous zone in 1999, and a 200 nm EEZ in 1983, consistent with customary international law as codified in UNCLOS. This customary law is a balanced compromise between a flag State’s interest in maritime shipping and a coastal State’s interest in protecting and managing its coastal waters. The U.S. sovereignty over its terrestrial lands extends to its internal waters and territorial sea, including the airspace above and the seabed below. Subject to ancient customs where nations should provide safe harbor to ships in danger or distress (force majure), the U.S. may restrict entry or travel through its internal waters. The U.S. may also prohibit the entry into portions of the territorial sea, provided there is still an area that allows for vessels to exercise their right of innocent passage through the territorial sea. “Passage” through the territorial sea must be continuous and expeditious, although that may include stopping and anchoring under certain circumstances. While warships are generally immune from laws and regulations, the U.S. has the right to require foreign warships comply with U.S. laws. If they don’t, the U.S. may order the foreign warship to leave its territorial sea. The contiguous zone is a buffer to the territorial sea, and within it, the U.S. may exercise the control necessary to prevent infringement of its customs, fiscal, immigration or sanitary laws and regulation of territorial sea. In addition, the U.S. may regulate the removal of cultural heritage, including foreign flagged vessels and nationals in its contiguous zone. It overlaps the EEZ which extends from the territorial sea out to 200 nm. The U.S. does not exercise sovereignty in the contiguous zone or the EEZ. It does have exclusive sovereign rights and jurisdicton for exploration and exploitation of natural resources of the seabed, subsoil, water column, and air space in the EEZ. All of these zones have a common point of reference from which they are measured: the baseline. The rules for determining the baseline under UNCLOS are substantively the same as those under the 1958 Convention, which the U.S. ratified in 1961. As a line that marks the inner limit of the territorial sea and the outer limit of internal waters, the baseline is comprised of the low water line on NOAA charts plus closing lines across legally-defined bays and rivers. The U.S. uses a normal baseline, as opposed to a straight baseline because of its interests in preserving the freedom of navigation. One of the most important facts for those relying on NOAA’s charts for the limits of these zones is that the baseline and all of the zones are ambulatory. They are subject to change due to accretion and erosion of the shore.